This week's Free GM Resource is another YouTube channel. I spent some free time this weekend surfing YouTube, admittedly on this nothing to do with gaming, but I re-watched a couple of terrain-making videos and managed to link-hop to the Drunkens & Dragons: Play D&D Like a Badass channel. Now whatever you do, use the provided links or actually write-down the name of the channel. Don't be like me and scribble down "Drunkards & Dragons". That is....how do I be polite....not a channel I got any enjoyment out of. 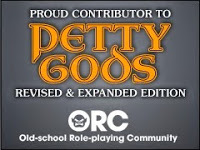 I'm generally OK with the occasional live-play podcast, but not videos. Anyway......you would be amazed at how many channels, webpages, etc. are some variation of "Drunk and Dragon". Thankfully I was able to go to YouTube on my computer and navigate through my viewing history to find the right channel. There are a few videos I really got something out of. My favorite has to be quick sculpting of ice/winter terrain using blue insulation foam and a lighter. It doesn't get much easier than that. 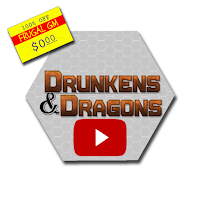 I still have a few of their videos I want to watch and know I have the right channel I can subscribe to Drunkens & Dragons: Play D&D Like a Badass.